This recipe comes via my New York based Aunt who, in turn, got it from her sister Nancy. The torte comes together quite easily and is perfect for a dinner party. Having just read J. Kenji López-Alt’s thoughtful study and discussion of the best apples for apple pie on Serious Eats, I chose to use Golden Delicious apples rather than the McIntosh apples suggested in the original recipe. 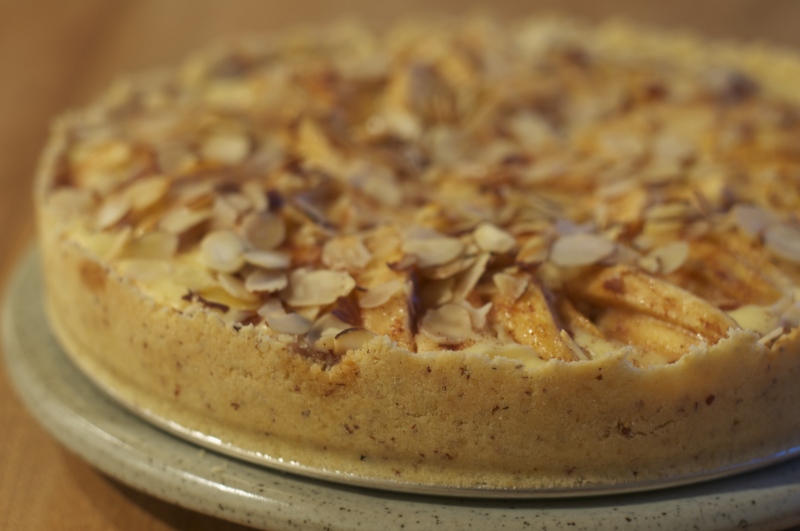 I was really pleased with the texture and consistency of the apples when the pie had baked. I have also seen a similar recipe that suggested Granny Smith apples. I think there is quite a bit of flexibility in your apple choice. The recipe doesn’t specify whether to use sliced blanched almonds or unblanched almonds. I chose the latter as I wanted the extra colour. I was glad I did. 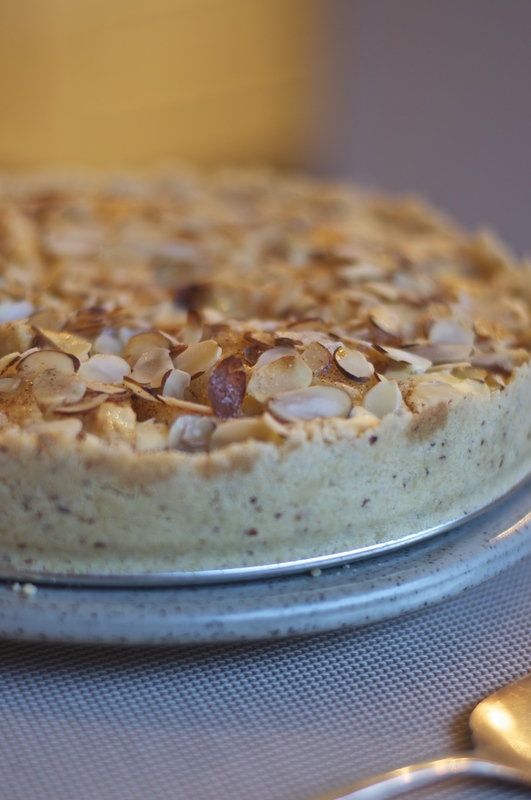 The torte would look rather pallid in the absence of the touch of colour that the glimpses of almond skin contribute. Preheat oven to 400 F. To prepare crust, pulse flour, almonds, sugar and salt in a food processor, using about 10 one-second pulses, until combined. With the motor running, add butter, a few pieces at a time. Add egg yolk and vanilla and process until evenly combined (Mixture will look like wet sand). Pat the crust into the bottom of a 9-inch springform pan and about 1-inch up the sides. To prepare filling, wipe out the food processor. Add egg, cream cheese, sugar and vanilla; process until smooth. Spread into the crust. To prepare topping, toss apples, sugar and cinnamon in a bowl and combine. Spoon over the filling, pressing gently. Top with almonds. Bake the torte for 15 minutes. Reduce oven temperature to 350 F. Continue baking until set around the edges, and just a bit jiggly in the center, 20 to 25 minutes more. Let cool on a wire rack for 15 minutes, then remove the pan sides and let cool completely, about 1 hour. Refrigerate until cold, at least 2 hours, before serving. Serves 10.